Unfortunately, the owner of the Wings of Pride MD-83 airplane have decided to withdraw it from the tarmac, so visitors can no longer tour it. On a positive note, the museum has opened two new rooms to help with the overabundance of artifacts. 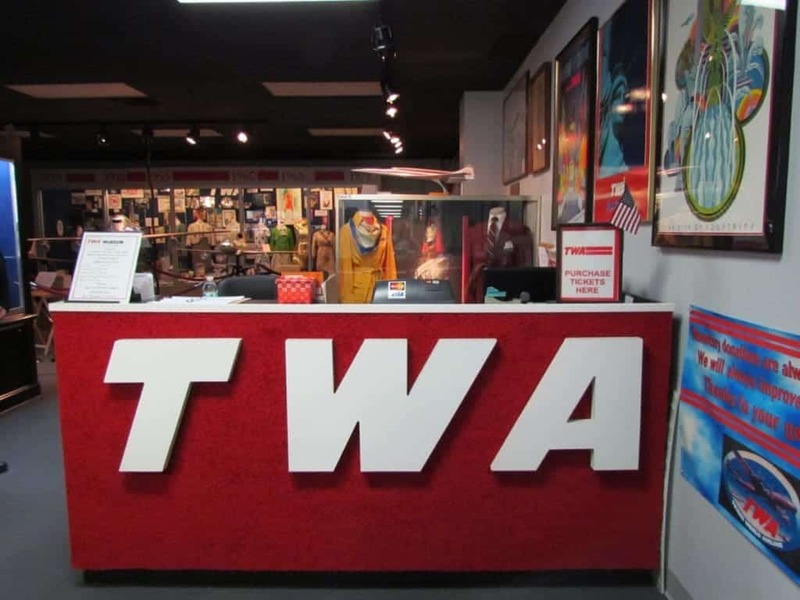 Let’s see a show of hands of the people who knew there is a TWA Museum in downtown Kansas City, Missouri. Well it looks like some of you knew, but this was a surprise for us. We made a stop in on a Saturday morning to check it out. Located at 10 Richards Road, in the Charles B. Wheeler Airport, this unique museum highlights the 75 year lifespan of the airline. Feel free to visit them on Tuesday through Saturdays. They are open from 10:00 to 4:00 each of those days, but double-check if the weather is especially bad. We want to thank the TWA Museum for their hospitality. Rest assured that all opinions are our own. The TWA Museum shares a building with an airline service that is still in business. This makes for an interesting visit, since guests may see a plane taking off or landing during their visit. Once inside the building, you make a left and head toward the section with the museum. As you walk, you will find an assortment of historical pictures and memorabilia. 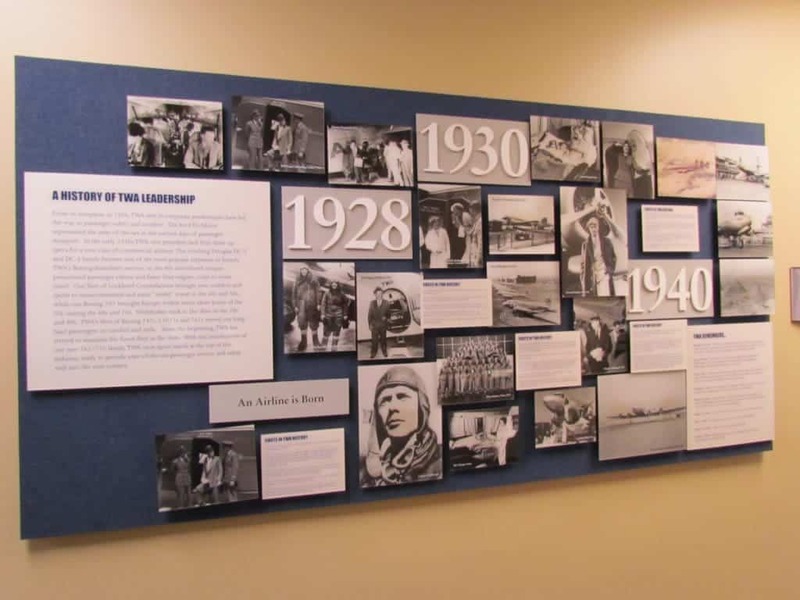 In the corridor that leads to the museum are a series of boards highlighting the chronology of the airline’s existence. Here you will also find interesting articles about some of the historic events that involved the airline or it’s employees. At the end of the hall you come to the official entrance to the museum. You will be greeted by one of the museum staff, who will happen to be a volunteer. The entire staff at the TWA Museum is made up of volunteers, and about 90% of these are former TWA employees. Prior to starting your tour, adults pay the $10.00 admission fee, and $7.00 for seniors and children 6-16. Anyone in the party younger than that will get free admission. Our tour took about two hours, which I would believe to be average. Our guide for the day was Wayne, who was a former TWA employee. He began by asking how much time we had, so they will certainly alter the length of the tour to meet your availability. Just a couple of weeks before our visit, we never even knew the TWA Museum existed. It’s not like TWA is some unknown company. They are probably one of the best known airlines worldwide, and were certainly a premier airline during their existence. Fortunately, we happened upon some information regarding the museum. Now we were preparing to hear a historical explanation of the airline from it’s infancy in 1930, until it’s purchase at the start of the 21st century by American Airlines. 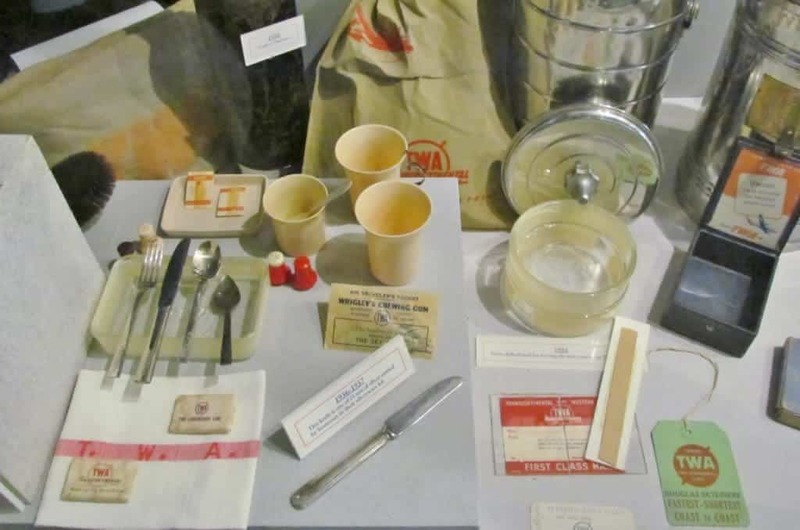 The airline served the world’s travel needs for over seven decades. What we knew of it barely scratched the surface of its history. Transcontinental & Western Air was born from a merger in 1930. Much of the air travel of those days was focused on the delivery of mail and goods. Charles Lindbergh was one of the founding members of the airline, having come from the Transcontinental Air Transport side of the merger. William “Jack” Frye came from the Western Air Express side, and ended up serving as president of the newly created airline from 1934 until 1947. The high profile pilots that TWA secured brought an air of credibility to TWA, and it became known as “The Airline run by Flyers”. Another notable celebrity from the airline’s early years was Amelia Earhart. 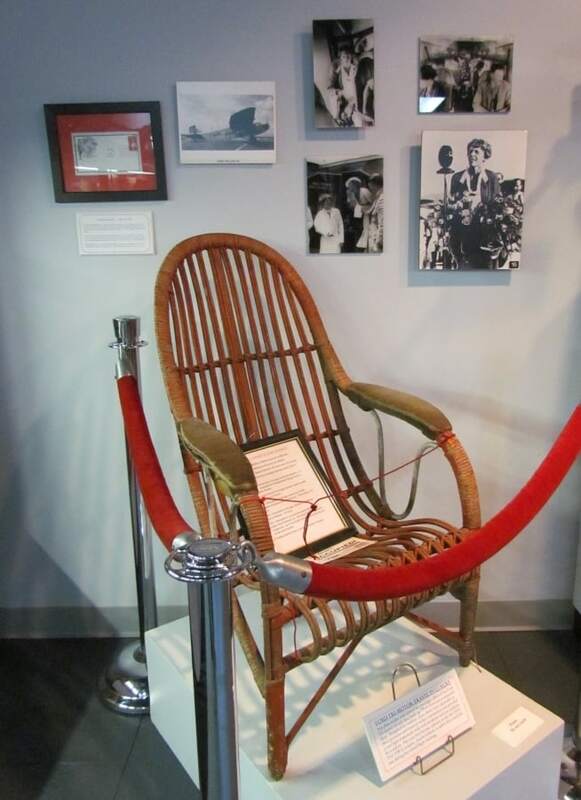 A corner in one room of the museum displays a chair that she had ridden in during a flight, as well as some publicity photos from her time with the airline. In 1931, the airline suffered a setback when one of their wooden planes crashed on its way to Wichita, Kansas. The death of eight people was compounded by one of them being football coach , Knute Rockne. The crash discredited the use of wooden framed aircraft, and helped usher in the era of all metal planes. This change would also create the research needed to allow aircraft to fly at higher altitudes, which had been impossible without pressurization. In 1937, Boeing Stratoliners began flying the skies, and came the first commercial planes with pressurized cabins. In 1938, at the urging of Jack Frye, Howard Hughes agreed to purchase 25% of the airline. 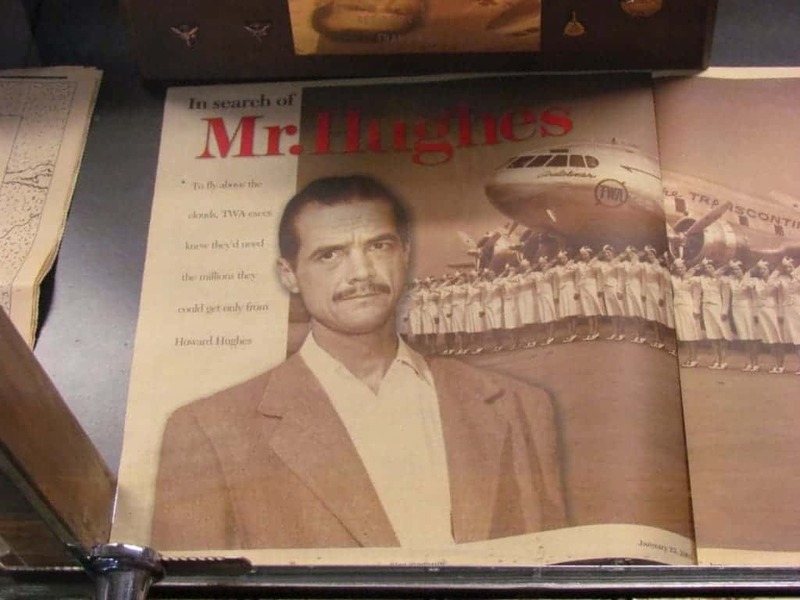 By 1941, Hughes had controlling interest in TWA, and the airline prospered during World War II. By the later half of the 1940’s, internal strife had dealt significant blows to the airline, and by 1958 the executive offices moved from Kansas City to New York City. The 1951 flood highlighted the need to create a new airport away from the often swollen riverbanks. This was the spark needed to build the new international airport north of the metro. At its peak, TWA employed over 20,000 employees, and was one of the largest employers in the Kansas City area. TWA led the way in many areas of the commercial aviation field. It was the first airline to hire an African-American flight attendant, and did so in 1958. In 1961, it became the first American airline to show in-flight movies. TWA developed the innovative idea to move gate access closer to street level. This was to provide quicker service to customers. It became a costly endeavor when the hijackings of the 1960’s forced tighter security measures. 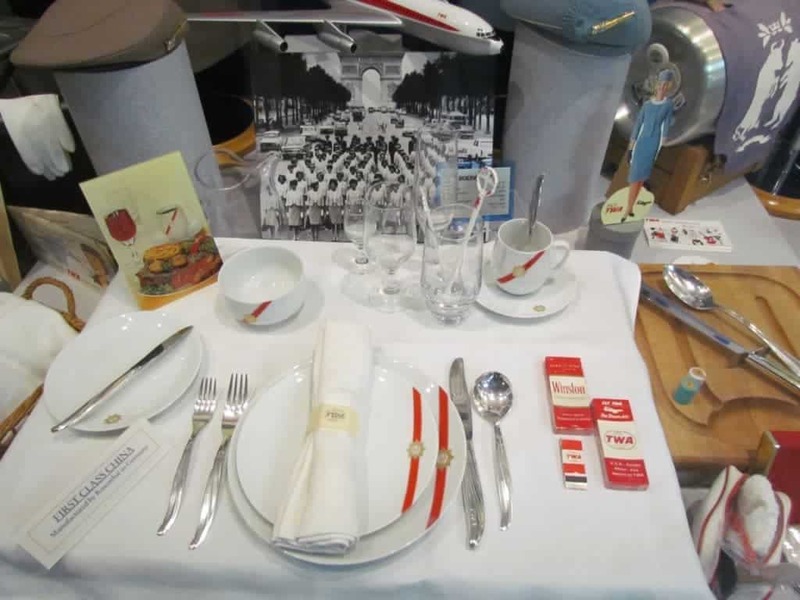 The pictures above show some of the items that would be commonly found during flight service over the years. In the 1930’s, the airline had strict requirements for their flight attendants, which included the requirement that they were nurses. During those days planes flew at much lower altitudes, since they weren’t pressurized. This led to excessive turbulence on many flights, and more illness than we see these days. While the idea of having nurses wasn’t meant to treat illness, it was thought it would be more reassuring for the passengers. 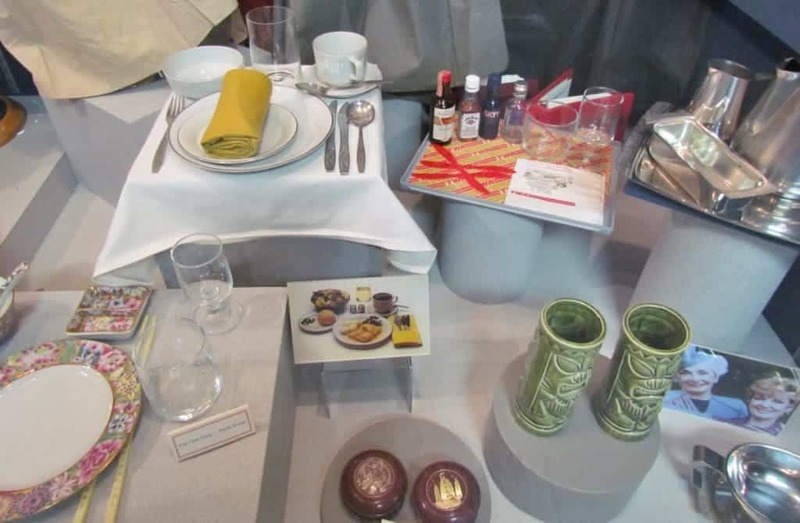 Through the years as flight comfort improved, so did the quality of items carried on the planes. 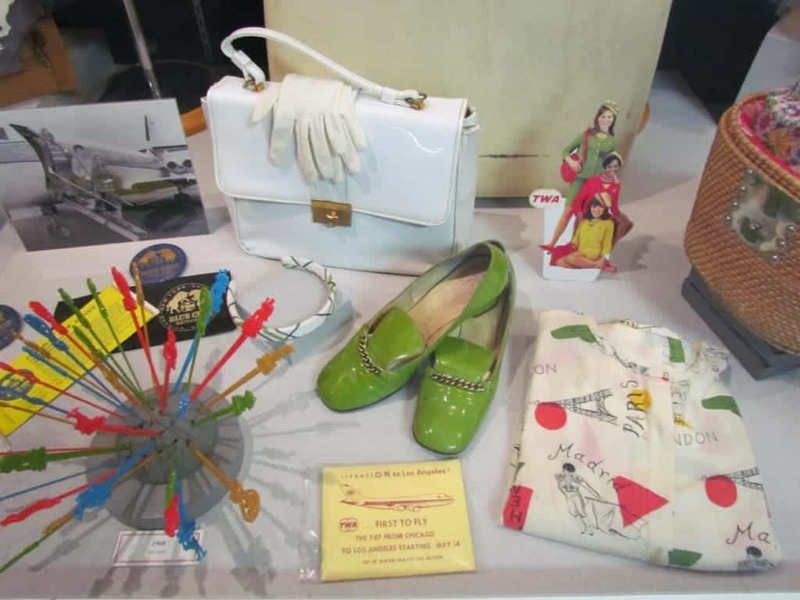 It is clearly apparent that the styles of the times were quite often reflected in the items found during flights. How many of these items do you remember? 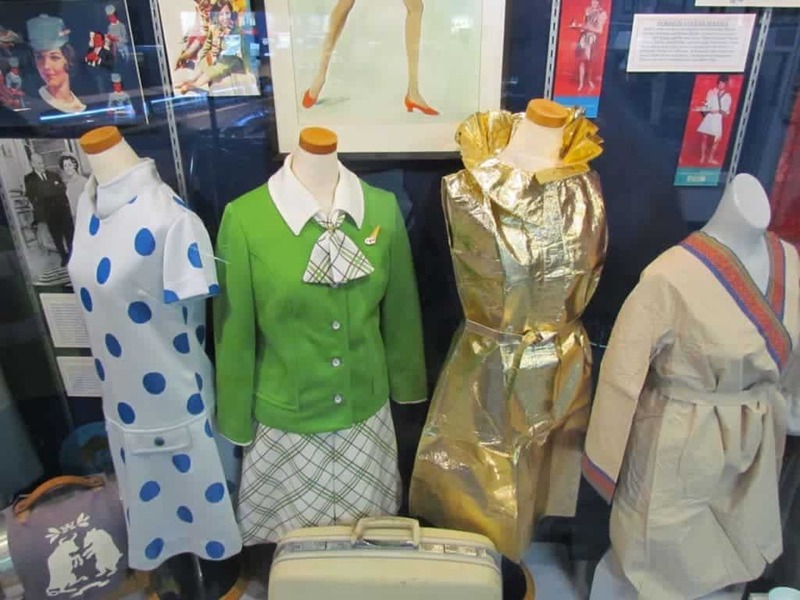 As many will remember, not only did the items onboard change through the years, so did the uniforms that flight attendants were required to wear. Some were designed to match the styles of the times, while others were meant to be used during certain promotions. The two on the right, in the picture above, were actually made of paper. 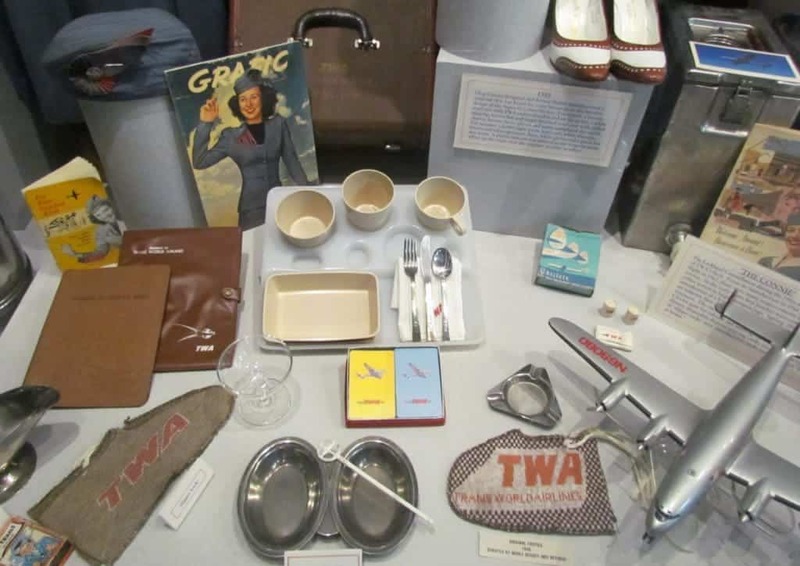 For almost one year, TWA tinkered with the idea of making their domestic flights more dramatic. They would designate one of four specific styles for each flight, and attendants were supplied uniforms to match the style, just before boarding. These paper uniforms were one size fits all, and ever increasing logistical issues caused the early abandonment of this promotion. One of the highest priorities of any airline is passenger safety. While accidents can and do occur, the goal is to get from point A to point B with no issues. 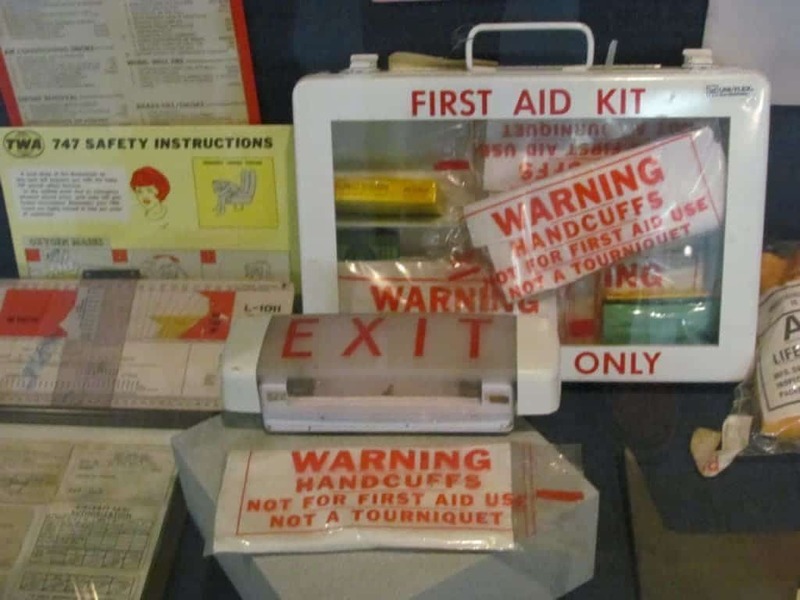 A wide array of safety equipment is available to flight crews, and the displays at the TWA Museum highlight some of the more unusual pieces. I personally had to chuckle at the display above. Someone felt it had to be noted that handcuffs did not make a viable substitute for a tourniquet. The TWA Museum encompasses a variety of rooms, and visitors will be ushered through the different areas. In the hanger area, we entered a side room that held assorted training devices used by airline staff. We watched as people flipped switches, slid levers, and studied instruments. These small scale models work well in explaining the skills required to pilot an airplane. Many of these exact devices were used in the field for pilot training. The room shown above is set up to replicate an area that would have been used as a classroom of sorts for various flight crew members. In 1994, after quite a few years of struggling performance the airline had seemingly turned the corner. To celebrate this significant accomplishment, the employees of TWA bought the lease of a MD-83, and gave it to the airline. The airplane briefly wore the standard red stripe on white field signature look, but was eventually brought to Kansas City for a makeover. The plane was repainted in an inverted style, which can be seen as the title photo at the top of this article. The idea was to symbolize that the airline was being reinvented from the inside out. This was the only plane to ever wear this look, and it is parked on the tarmac at KC’s downtown airport. Visitors to the TWA Museum are escorted out to the plane, where they have an opportunity to experience it first-hand. 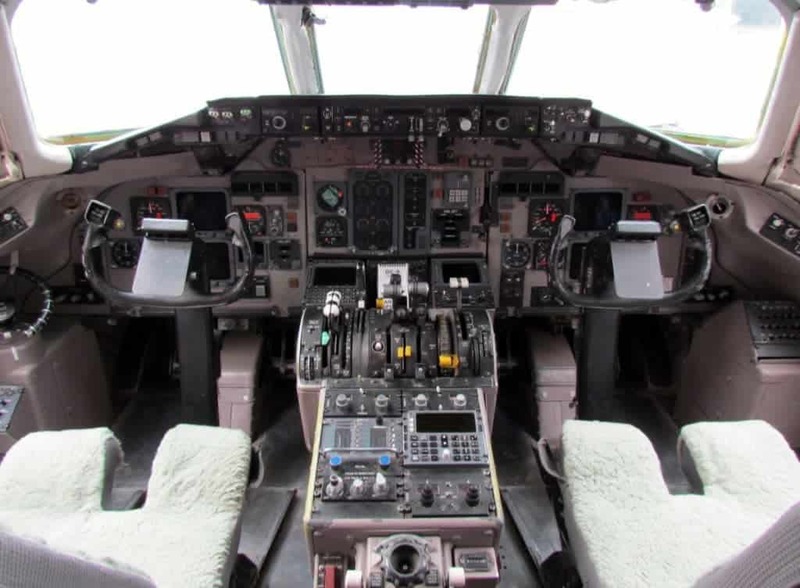 It’s a chance to see just how close quarters the cockpit is in a standard jet airplane. As we walked around and under the plane, we got a more realistic understanding of the true size of one of these modern marvels. 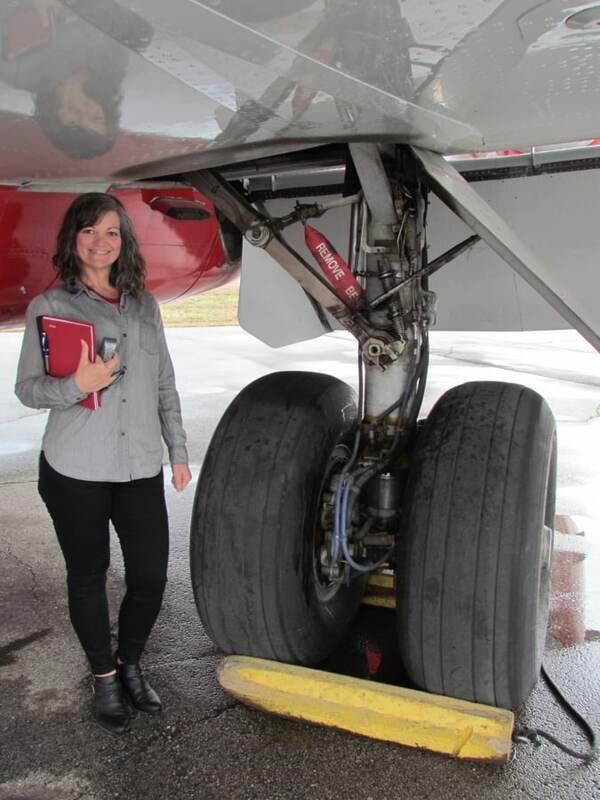 We knew that the landing gear were over-sized, but until you are right up on them you don’t realize just how much. While we toured the tarmac area, we were treated to the landing of a private jet. No matter how often we see this occurrence, it is still mesmerizing to watch. Our walk back through the hanger allowed us to view, but not take pictures, many of the private planes that call this airport home. Back inside the main section of the museum, we came to an area that seems pretty popular. 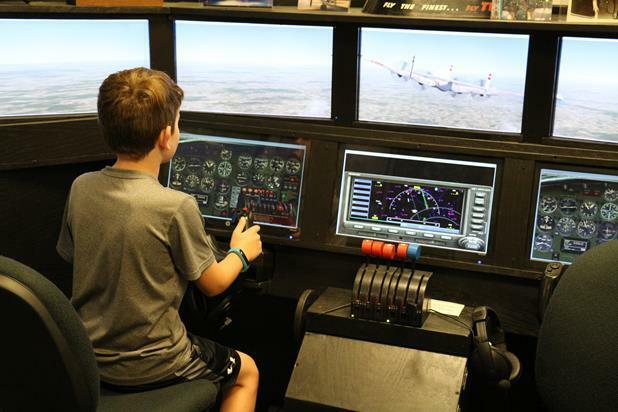 In one corner sat a flight simulator, which can be enjoyed by museum visitors. Wayne explained how many times they will see past employees test their skills on the device. Even retired pilots will give it a try, and not always with superior results they had hoped for. We were told that while the current simulator is based on flying a propeller powered plane, a new device was expected soon. It would be based on the attributes of flying a jet airliner. I’m pretty sure a return visit is in the cards, so that I can test my skills in that arena. 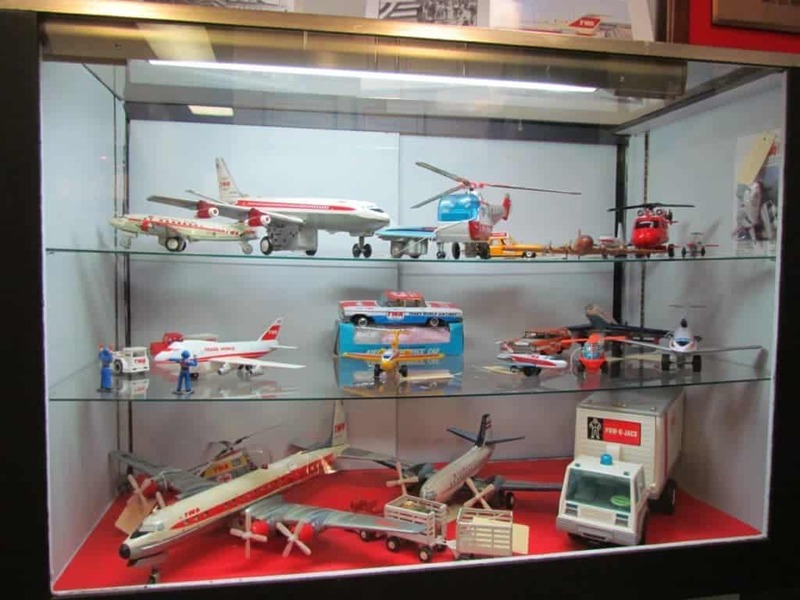 TWA was such an integral part of American life, that there are even a couple of display cases filled with toys based on the airline. 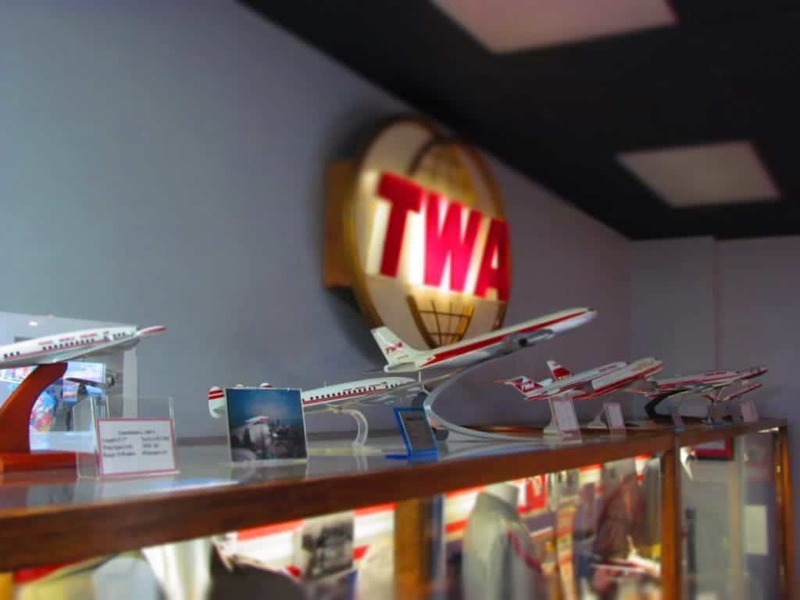 The TWA logo adorns model planes, helicopters, cars, trucks, and other assorted items. I remember some of these from my youth, as I am sure most people would. The depth of saturation that this company had into American life shows just how integral their role was to the population. As our time to leave neared, we returned to the main room of the museum. Here is where many of the volunteers wait for new visitors to arrive for tours. Our tour had been done in a different sequence than normal, but it still encompassed all of the displays usually available. The day we visited there was an event scheduled, so we jumped ahead on the outdoor section, so as not to interfere with the impending celebration. As we moved from area to area, we ran into lots of the volunteer staff members. It was quite impressive the way that they all interact, not only with each other, but with the visitors. It is apparent that these people not only care about sharing the airline’s history, but are truly dedicated to preserving that history. 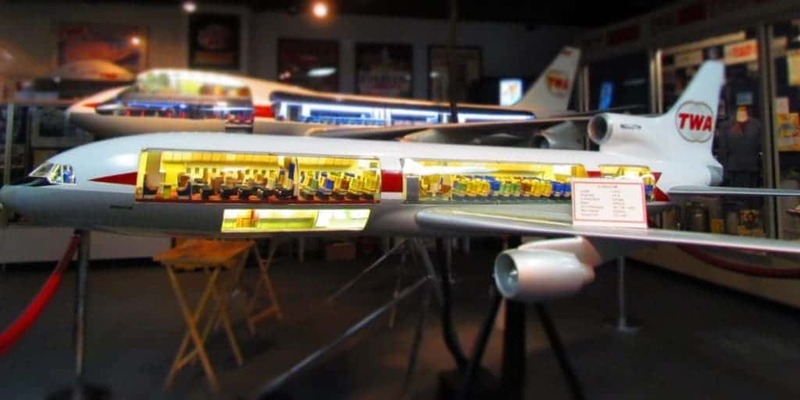 A visit to this most unusual museum is sure to provide a new found respect for the inner workings of an airline. While we spent two hours there, we left knowing there were many parts we had not seen in detail. For your visit be sure to allot plenty of time to see, hear, and explore this great Kansas City museum. I have know about this place and had some other friends have gone,but just haven’t taken the time to get there for a visit. After reading your article I am moving it up on my list to visit within the next month. Do you get to tour the inside of the plane? Yes! The cockpit picture is from the plane on the tarmac. You are quite welcome. We are glad you enjoyed the article. I would love to visit this museum one day, Jeff and Crystal! Thanks for the informative and educational post! You are welcome. We hope you get the chance some day. I am THRILLED to see this. I am one of the many volunteers at the TWA Museum. We are very passionate about TWA and getting the opportunity to share this with our visitors. Thank you for such a wonderful article!!! You are quite welcome, and thank you for volunteering. The museum is certainly a jewel in our city. The TWA Museum was very interesting & quite a thrill for 2 laid off/retired Boeing Wichita employees. We wouldn’t have heard about it, but I just happened to read this article right before our trip. I look forward to reading more about restaurants & attractions on the Our Changing Lives website. We are so glad you stumbled upon our website. Thanks for visiting KC, and taking in a few sights. Travel safely, and we hope you get the chance to visit some of the other places we have highlighted on future trips. Glad to see this, I will have to come down and visit. Back in the late 50’s and early 60’s my grandfather was the building supervisor at Midland Hall, that was where the stewardesses in training stayed. Remember all the young ladies that stayed there while training. I was young then like having a lot of older sisters. Good memories. So glad to hear that it brought back the positive memories. We hope you enjoy your visit. I grew up close to the downtown airport and graduated from NKCHS class of 63′. It was all about TWA and the KC Chiefs in Kansas City at the time. Five of my HS classmates became TWA pilots and six of my classmates became TWA light attendants. When my parents flew TWA, my father wore a suit and tie and my mother would ware a suit, hat and fur. It was an exciting experience for them. My aunt worked at theTWA office 14th and Baltimore. I believe the TWA emblem is still on the outside of the building. In my world travels I think I visited every TWA Ambassador Club. If you get a chance you must visit the new TWA hotel in the original TWA terminal at JFK, same lobby and club and tons of memorabilia. I still keep in touch with two of the club attendants NY and LA. Thanks for sharing. We are so glad you enjoyed the article. Glad you have so many memories to share.